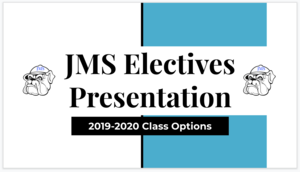 Click on the title above to learn about the available elective options. CAASPP Testing for Math and Language Arts will be happening on May 7- May 10 for sixth graders and on May 14- May 17 for seventh and eighth graders. Information about the "Momo Challenge"
Please see in the attached notice information about online safety that Jefferson families should be aware of. The Special Education Department will host its next Family Workshop of 2018-2019 entitled “Supporting Your Child's Language & Communication” on Wednesday, March 13th from 6:30pm to 8:00pm in the District Office’s Board Room. We are thrilled to have our very own Speech team present at this training! Following commencement each year, the Jefferson PTA sponsors a celebration of our students' accomplishment. Please consider donating to make this the best possible celebration for our graduates. Flyers in English and Spanish are attached. Information Night about high school for current 8th-grade parents at Gabrielino's Goodson Theatre, 7pm. Students who are interested in trying-out for next year's Speech team can sign up in their Language Arts classes.